The TAS Group of Sergiy Tigipko has reached a preliminary agreement on acquisition of PrJSC Kuznya on Rybalsky Plant (both based in Kyiv), the press service of the group told Interfax-Ukraine on Thursday. "At the current stage an application to buy shares in PrJSC Kuznya on Rybalsky Plant has been submitted to the Antimonopoly Committee of Ukraine. After receiving a permit from the regulator, the sides plan to continue finalizing the deal," the press service said in response to the official inquiry by Interfax-Ukraine. "The cost of the deal and its terms are not disclosed. The TAS Group will announce its plans on the further development of the enterprise after receiving the permit from the Antimonopoly Committee of Ukraine," the press service said. 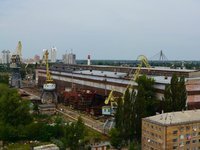 According to the response to the inquiry, the preliminary agreement on the deal to buy shares in the shipyard was reached after holding negotiations between the TAS Group and the owner of Kuznya on Rybalsky Plant. "The TAS Group is actively investing in the Ukrainian economy and considering those investment projects that meet its long-term development strategy," the press service said.